Proof of the Godman - Statistically Speaking Submitted By Merwan Mehta - JaiBaba.com! Your Avatar Meher Baba Oasis on the net! One day I was having one of those intellectual discussions about Baba when someone who was a little skeptical about the Godman, hinted to me - what if all that Baba claims is a figment of imagination. The thought came to me then that how easy it would have been if Baba had performed some miracles and that way left some compelling evidence that would have enabled us to get over the belief hump, and on to the true business of loving Him. Baba said that performing miracles disturbs the equilibrium of the cosmos, as the natural order of things is over-powered. Baba had numerous “slips” wherein He performed several miracles that the mandali have experienced, and told us about. One of those that not only was told to us but to which quite a few of us were fortunate enough to witness firsthand, was the appearance of the image of Baba’s face on a tree trunk outside Mehera’s bedroom window in 1969 after Baba passed away. There was a small flower garden outside Mehera’s bedroom that she had planted for Baba to enjoy. In the garden and right outside the bedroom window there was a large wild-fig tree, that the Indians call the “umar tree.” This tree was always there and Mehera never really noticed it. After Baba dropped His body on January 31st, 1969, Mehera was grief stricken. The mandali did their best to console her but nothing could fill the void that Baba had left. In July 1969, one day standing at her bedroom window that she shared with Baba’s sister Mani, she was looking out when she felt her eyes being drawn to the umar tree. On the trunk of the tree was an image of Baba’s face looking so lovely with a crown on His head. The image was such that it seemed to be looking right at Mehera’s window. Mehera was overjoyed. What a perfect way for Him to show His presence. Mehera called Mani to see the image, who then called the other ladies. Then the men mandali came to see the image and later the whole village of Pimpalgaon came to see it, and then all who visited Meherazad during that time saw it too. Mani took pictures and sent them all over. Mehera and Mani revered the special treat Baba had bestowed on them. The umar tree had become precious to Mehera, and she every morning after this incidence placed a marigold on the crown of Baba’s image. This image stayed for seven years from 1969 to around 1976 till the bark shed, and I was lucky to have witnessed the image. Being a curious teenager, I had gone quite close to the image to verify that it truly was a natural formation, though nobody was allowed to touch it. I was awestruck by its detail and perfect positioning with respect to Mehera’s window. If you went in to Mehera’s quarters, you could see Baba’s face from Mehera’s bedroom door, such that it was right in the center of the window. As I look back at it now, I began to wonder if this was a small miracle that Baba had performed for His beloved, or was it a chance happening. Being statistically inclined, I began to wonder what the probability would be of this happening without any external intervention. ii) The other assumption is that this umar-tree has figured out a way to mold its bark such that it carves out images from it. How this can be done and what makes the tree do something like this, I believe is not in the know of present day science. I would like to request the statistically challenged amongst us to bear with me for a while, and I promise to not attempt to lose you in the discussion. The umar tree is say around 20 inches in diameter and is around 40 feet tall. The total surface area of the tree hence is around 150,700 square inches. The image which is around 8 inches in diameter and hence 50 square inches in area, could have come out anywhere on the tree’s 150,700 square inches. Hence, the probability of this happening is 50 divided by 150,700, or 1 in 3000. The image was seen for seven years. We make another assumption here and that is this could have been any seven years in say a human’s maximum life-span of a hundred years. Also, say the past 100 years is when we had the means to photograph and document such happenings and hence we use a 100 years. Hence, the probability of this happening is 7 divided by 100, or 1 in 14. The image could have been rotated such that the face could have been upside down, or at any other rotated angle. Say the rotation can occur in 15 degree increments. Hence, the probability of this happening is 15 divided by 360 degrees in a circle, or 1 in 24. Hence, the total probability of this happening is the product of the three probabilities that we calculated, 1 in 3000, 1 in 14, and 1 in 24. This comes to a probability of 1 in 1,008,000. Hence, the chance of this happening, is a one in a million chance. 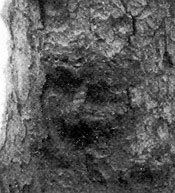 Now bear in mind this one in a million chance is with the assumption that the image can only be seen on this particular tree. If it could be seen on any tree in the world, you will have to multiply the probability of 1 in 1,008,000 by 1 divided by the number of trees in the world, which could make the probability of this happening in maybe 1 in a 100 trillion. (Assumption is that the world has a 100 trillion trees). The other assumption that the tree has within its means to come up with an image of that kind, is much more complex and farfetched. What would give the tree the means and knowhow to do so. This further reduces the probability of a chance happening to an even smaller probability of it occuring. 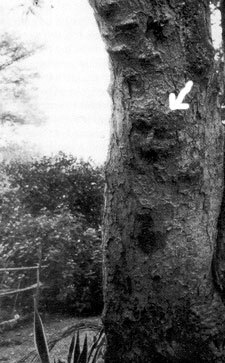 One in a million chance is good enough for me to be convinced that Baba had to have performed a miracle for His only beloved, showing the image of His face on the tree trunk outside her window. Hence, this event was not only an event for Mehera that helped her reduce the pain of losing Baba, but also can serve to the rest of us who seek proof of His claim as the Godman.